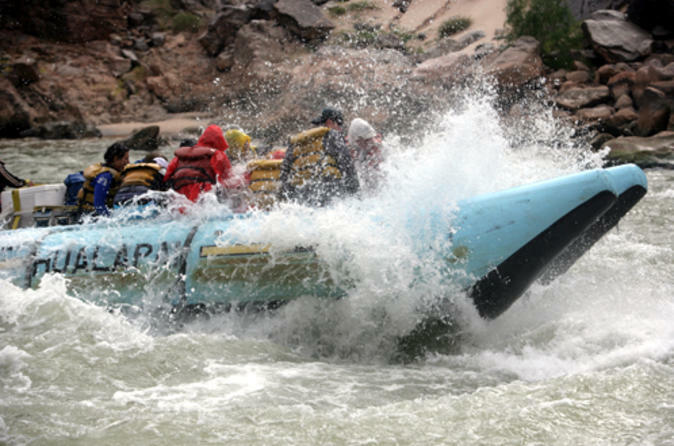 If you already have a car, this is the perfect one-day Grand Canyon white water rafting tour. Drive yourself from Flagstaff or Las Vegas to Peach Springs, Arizona, home to the Hualapai Indians at the gateway to the Grand Canyon. Here, you will check in and transfer by van to the Colorado River for your 5.5-hour white water rafting adventure. Your native Hualapai guide will lead you through class 3 to class 6 rapids on your 40-mile (64-km) journey through the Grand Canyon. (Note: The Grand Canyon operates on a 1-10 scale of rapids instead of the worldwide I-VI classification.) Stops are made throughout the trip so you can discover hidden canyons and waterfalls, including Tavertine Waterfall. A boxed lunch is included, which you can enjoy in the solitude of the canyon. Be sure to bring your camera for incredible photo opportunities! If option is selected you tour will end on board a six-seat, A-Star helicopter for your a quick 4,000-foot transfer to the West Rim of the Grand Canyon. Return by van to Peach Springs and your awaiting car for your return journey to Las Vegas or Flagstaff. Need transportation from Las Vegas? Round-trip transportation is available, see below for details.